Amazon forces me to self-reflect | Critical End! This is Magical Mystery Tour, the weirdest of the Beatles’ movies. Directed mostly by a very high Paul McCartney if I recall my lore correctly. I bring this up because this film has the distinction of being the oldest thing on my Amazon wishlist. I know this because Amazon now puts a little note next to each item on your list saying how long it’s been there. I’m not sure if that’s supposed to provide some kind of service to your gift-buying friends or if it’s just a novelty, but it did reveal to me that I have wanted Magical Mystery Tour on DVD for nine years. I was unaware I’d even had an Amazon wishlist for that long. Of course, I do have a job. 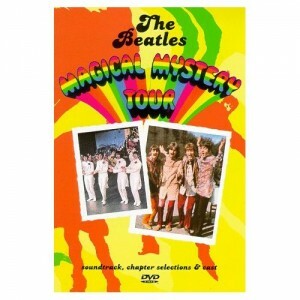 If I wanted Magical Mystery Tour so badly I would go buy it. Yes, it’s out of print (in fact I believe it actually went back into print and then back out of print during these last nine years), but I’m sure I could track a copy down. The thing is I don’t really want it that much. I’m just a Beatles completist and feel like I should have it. This caused me to realize that there are a TON of other items on my notoriously long list that fit the same bill. The book version of “The Princess Bride”? Four years on the list. What’s Up, Tiger Lily? Added five years ago. Evil Dead: Hail to the King for the original PlayStation? Six year veteran of the list. I do not even own an original PlayStation anymore. but I marked it high priority, so you know I’m serious. Am I alone in my greed or do you guys also have long-desired purchases that you’ll never get around to making? This entry was posted on Friday, August 14th, 2009 at 4:05 pmand is filed under . You can follow any responses to this entry through the RSS 2.0 feed. Both comments and pings are currently closed.